Winter is here, and with it comes flu and cold season. But with today’s #urbantip you can fight back and keep healthy all season long. 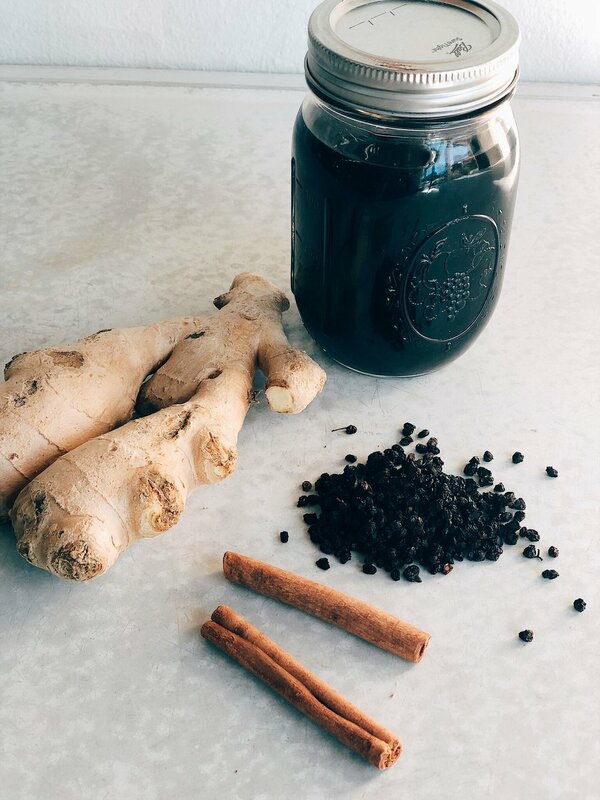 We’re showing you how to make two natural remedies to ward off colds/flus and keep your immune system strong! Enter in: Fire Cider and Elderberry Syrup! Fire Cider is an old folk remedy than can help to fight off colds, relieve sinus congestion, aid digestion, and improve circulation! It can be consumed as a shot, or added to a drink. Think of it as a savory shrub (hello healthy bloody marys)! There are a lot of ways to make fire cider but our favorite recipe uses horseradish, onion, garlic, grapefruit, ginger, lemons, turmeric, rosemary and apple cider vinegar. Once the blend is fully steeped, the veggies are strained out and you’re left with an elixir usually sweetened with honey and then ready to use. We like to use a homemade Honey Cayenne syrup to boost the health benefits even more! Variations: You can add jalapeños, habaneros, thyme, rose-hips, oranges, limes, oregano, parsley, burdock or peppercorns as well. Don't worry about amounts- just fill the jar with what you want! Usage: We recommend taking 1 Tablespoon a day. It can be mixed with water, used to make salad dressing or drizzled on top of stir frys. 1. Wash gallon glass jar with vinegar water. 2. 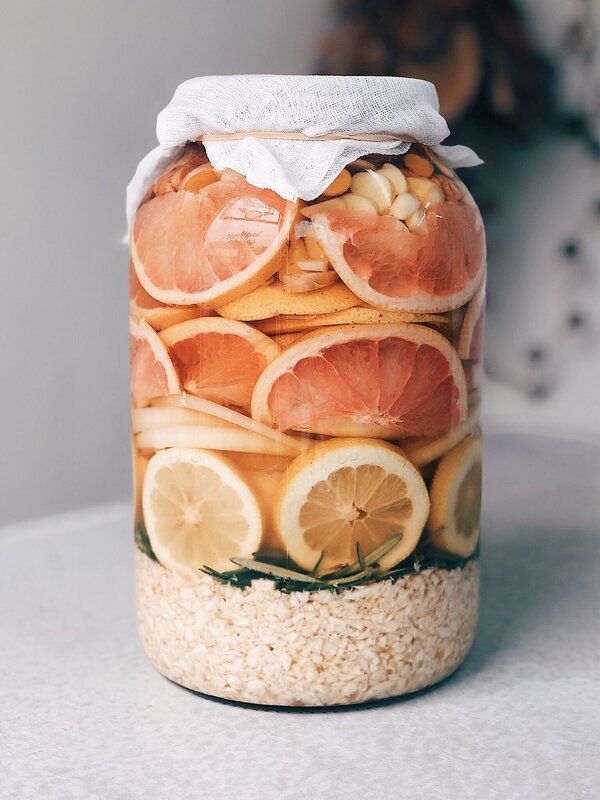 Layer horseradish, rosemary, lemon, onions, pink grapefruit, garlic, and turmeric in the gallon jar, top with apple cider vinegar and allow to cure 4 weeks / 1 month. 3. After it has soaked strain vinegar away from jar. Do not discard content- instead cover them in apple cider vinegar again and allow for a second cure. We will reuse these up to 3 times before discarding. 4. Next bring cayenne, water and honey up to a simmer until honey is fully dissolved. Allow it to completely cool to room temperature. 5. Add honey syrup to your cured apple cider vinegar and stir well. Yup, this tasty syrup can actually decrease your symptoms if you’re already sick! What are you waiting for, it’s time to make some syrup! Usage: Take 1 tsp a day. Cheers to the New Year and fighting off all those nasty colds that may try to come our way. Wishing you happiness and health this year!